Once again we follow the well traveled scholar Regis of Werta to the city of Greifshold. Where to eat? Where to sleep? What to do? Fear not traveler, Regis will answer your questions and provide the one or other anecdote. Greifshold is a fairly young city. It was founded a little more than 40 years ago by the illustrious Aldrich of House Gladwyn, who later received the title Margrave of Greifshold. After his death three years ago and the passing of his wife Margravine Ethel only a year later, his only daughter Elswyth followed him and rules Greifshold wisely to this day. The Coat of Arms of the Margravate of Greifshold shows a tower and an oak tree. After crushing the rebellion of local tribes the Margrave altered the Coat of Arms to show a tower in one field, symbolising Herleva’s Stand, the last refuge of the rebels and the place where the rebellion as well as its leader died. The oak tree is an older symbol, representing wise rulership, steadiness and strength and was featured on two of four fields in the past. Greifshold shares this symbol with the city of Werta, Aldrich’s place of birth, but instead of blue, green, red and yellow stripes Werta’s coat of arms shows a checker board pattern in two fields and the original two oak trees. You will arrive in the Margravate at one of two harbours: Greifshold or, further to the east, Breka. If you are not used to the hustle and bustle of a city I advise to debark in Breka, a quaint fishing village with a rich history and all the amenities a weary traveller may need. Should you arrive in Greifshold you will realise that the city walls do not enclose the harbour district, nor the quay. When Greifshold was established and its walls built, Breka was already well established as a berthing place, only later Aldrich decided to build a harbour south of Greifshold. Lacking the natural protection Breka is afforded Greifhold’s harbour cannot be used throughout winter, when the Serpent Bay is plagued by storms. The locals call these “Kerto’s Wrath”, after the sea serpent they believe rests deep beneath the waves. Keep this in mind when you plan your onward travels, I know a number of tradesmen that had to extend their stay unwillingly. The fish market will offer you ample opportunity to buy fresh, smoked and pickled produce. A most welcome sight after weeks of hardtack! You can also find leather workers, potters and spice traders. Be advised that the Hengemen that dwell in the forest have no appreciation for coin. However, they trade in kind. I hear they crave spices the most of all things the civilised world offers. Close to the quay you will find for a few weeks each year a yellow and blue striped tent, with a stuffed peacock mounted in front of it. It harbours a sort of curiosity cabinet called “Trip’s Marvellous Mysticalities”, but I understand the owner, a Halfling called Trip Haggelton, also organises stage plays for the commoners and nobles alike. I talked to a petite dancer that joined the troupe recently, a half-elf called Syliriael. She is truly gifted in the free arts and will gladly perform songs and ballads for coin. 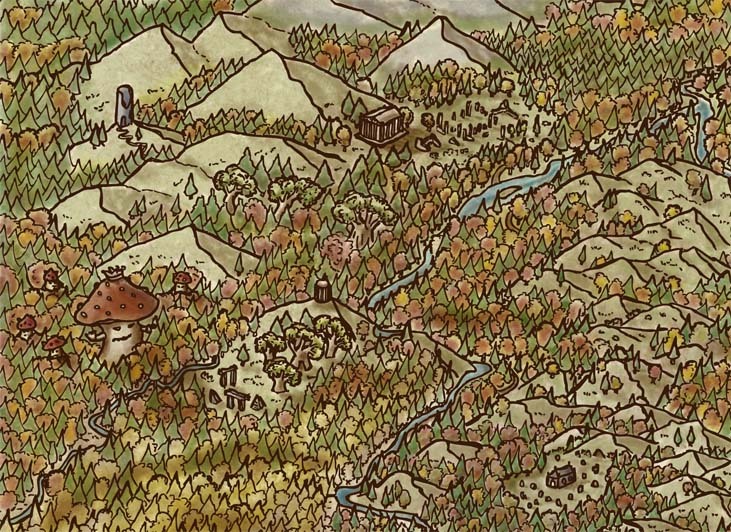 If the troupe is in town they lodge at the “Gilded Oak”, a well-regarded establishment in Greifshold. The cabinet of curiosities may quench your thirst for the exotic, the marvellous and the mysterious. For only a few coins you can see a selection of rare minerals and crystals, as well as exotic armour made of fish bones and what appears to be layered linen. Some of the curiosities on display are of Hengemen make, with a woodcarving resembling a female figure with an enlarged head and what seems to be scaly bark going down her spine, being the most notable item. To titillate more grisly offerings are presented, such as shrunken heads and deformed creatures preserved in spirits. I saw a four-headed unborn Ettin, presumably cut from the womb and a human child with the features of a lizard. These artefacts are most extraordinary and will be of interest to students of the metaphysical. Blackquill Forest and its sourroundings. Drawn by Gilford of Jorburg. When I visited they also had an odd sentient fungi on display, but it was small in size and could not speak. It resembled a Fly Agaric with a reddish, white-spotted cap, yet the stem showed an opening that I surmise is an orifice to consume food. It also had small, squinty eyes, similar in colour to those of a raven. Trip claims they caught it in the far west, beyond the Black Quill Forest and the ruins of Griffonwatch. The dock worker’s children found this creature most exhilarating. None of the locals was forthcoming with information on these creatures and apparently the one caught is the only of its kind. There is a tavern just past the spice traders close to the east gate of Greifshold, called “The Salty Serpent”. I found the ale stale and warm, the food greasy and tasteless and the rooms unkempt. I came down with an upset stomach frequenting this establishment and felt itchy for a whole week after sleeping in one of the beds of straw. Avoid the “House Special” at all costs. To what length I go, dear traveler, to offer you advice! The barkeep is called Manley. A jovial character that prides himself to be able to procure everything a client wishes for. It is said that one can make certain acquaintances in this establishment. Granted, he seems well connected, but I did not take him up on his offer. If gossip and cheap drink is what you seek, this place may still suit. The only agreeable item on the menu was a five spice spirit called “Ettin’s Breath”. It is a pungent local speciality, but surprisingly mellow and warming with an aftertaste of cinnamon, gloves and raisins. It served me well during my travels and keeps the belly warm. When you enter the east gate make sure to report to the guards. During day the gate is open. Only noblemen are allowed to wield weapons inside the city walls. Present your pedigree to the guards or leave your weapons with them. If you are a practitioner of the arcane arts do not display your talents within the city walls. 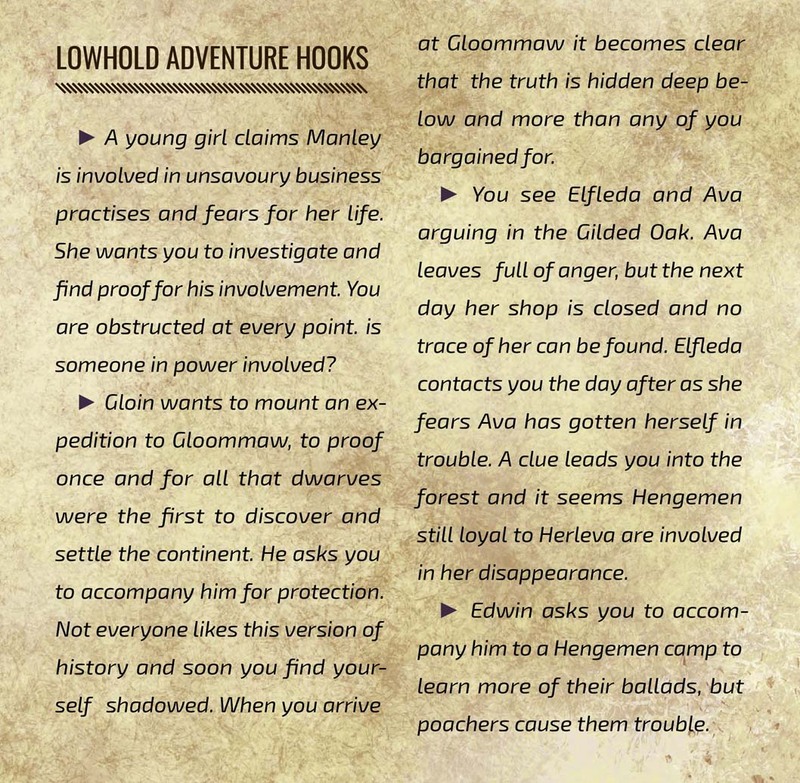 The Margravine does not take it lightly if her laws are broken and I heard of a few poor souls that lived out their days in the twilight of Greifshold’s dungeon. Greifshold is separated in a “Highhold” and “Lowhold” by its outer and inner walls, connected by the “Oaken Gate”. Lowhold is again separated into two districts “Fir Gate” and “Fish Gate”, corresponding to the western and eastern parts of Lowhold. Greifshold is a rather small city, but you can still get lost in small alleyways, as only some of the larger alleys are named. A blacksmith is located right at the Fir Gate: “Gloin’s Hammer”. Its proprietor Gloin Wyrmrend is a skilled craftsman. The only dwarf in the Margravate I encountered he is surprisingly friendly, especially if you bring him a barrel of Stoneoak ale. He is always keen to get his hands on exotic materials and specialises in axes. He supplies the men and women of Oak Bridge to the west, a small lumbering settlement. He is convinced that his brethren travelled to the Margravate hundreds of years before the first humans. There is little evidence to corroborate this claim, but he feels strongly about it and I would recommend to not challenge him on this matter. One of his human competitors that I can also recommend is Mace of Jorburg, who specialises in armour. His mail is well crafted and he can repair your armour should it have suffered in combat or if it was exposed to the elements. His workshop “Anvil and Needle” is located in a house with red tinted walls close to the “Oaken Gate” in a small side alley. His sister Wassa owns a tailoring shop on the second storey of the house, thus the quaint name. She is not as skilled with furs as the people of Breka, but she will be able to work with simple fabrics made of linen and wool. You will be hard pressed to find luxurious fabrics such as silk, at least outside of Highhold. She will be happy to mend your cloak or sleeve for a fair price and sells hardy and long-wearing clothing. There are two taverns that I will point out, but there are many more to choose from. I already told you about the “Gilded Oak”. If you have the coin they offer the best rooms in Greifshold. The tavern is located in Fir Gate on the main road. Clean, soft down feather beddings and cottony pillows will make your night’s rest most enjoyable and keep you warm in the depth of winter. A hot bath, perfumed with petals and enriched with pine oil, will nourish your skin and soul after you endured the hardships of the road. The food is exquisite. The cook, a stout lady by the name of Corliss hailing from Jorburg, will make you feel at home with hearty stews, gammon, venison and the freshest local produce. I recommend “Kerto’s Platter”, offering a selection of the delicacies of the Serpent Bay: Smoked Redtail, baked Brown Trout, braised Serpent Teeth – a delicious mollusc – with fresh herbs on a beet of oven baked potatoes, turnips, carrots and beets. The selection of imported wines is also noteworthy, but I recommend a stone of the local beer or mead. The Stoneoak brewery operates now for more than thirty years and makes as good a beer as you would find in Werta. The brew master Burgess of Werta visits the “Gilded Oak” often and always obliges curious questions about the art of brewing. When Trip’s troupe is in Greifshold you will be entertained with song and plays each evening. The ensemble calls itself “The Green Lutes” and, as the name suggests, colours their instruments green. Such talent deserves silver, if not gold coin, and a stingy client is looked down on in such a refined establishment. Private entertainment for you and your fellow travelers can be arranged, ranging from dance, to poetry, to stimulating conversation, but comes at a price. Finally, should you require the services of a stable the Gilded Oak offers such amenities and will care for your mounts. You may also be able to purchase a horse, but they are a rare sight in the margravate, given the forested and hilly landscape is best traversed on foot or with a donkey. Some farmers in the Green Bent breed mules, more intelligent than donkeys and hardier than a horse. 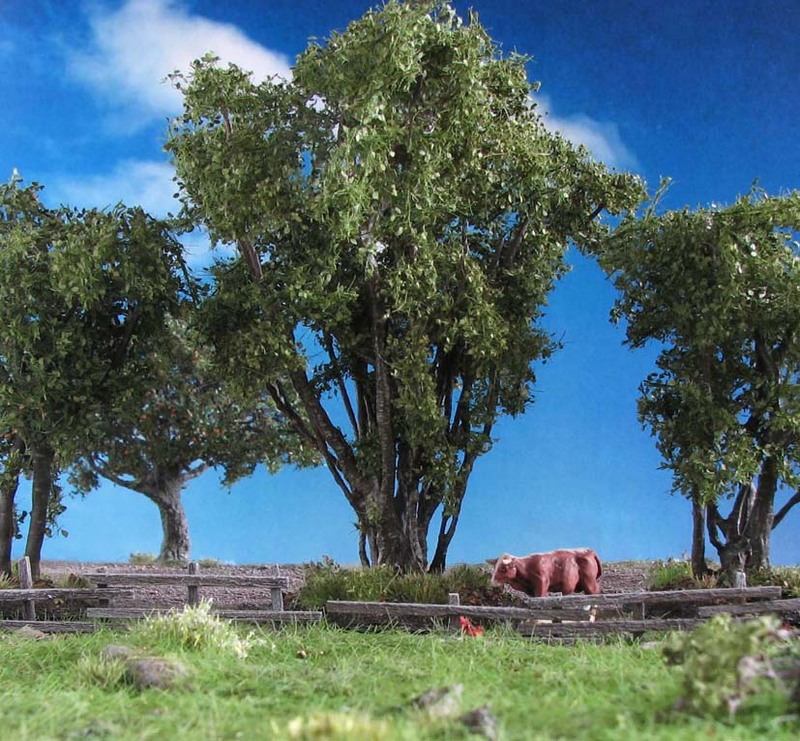 Horses may be a rare sight in the Margravate, but the Green Bent offers plenty of grassland for cattle. If you look for more affordable rooms and are willing to forgo some comfort, you will enjoy the “Clucking Goose” nestled up to the southern city walls between the Fish and Fir Gate. A rustic atmosphere is accompanied by honest, wholesome food. The menu offers a variety of stews and soups. You may find some morsels of meat in them, but lentils, barely and kibbled wheat will fill your stomach and your thirst will be quenched with the house brew. It is by no means bad, but the brewer is not as skilled as Burgess. The rooms are clean and the beds good enough for a restful night. What sets this establishment apart from other taverns in Greifshold is the owner and his wife. Farley and Kyla are honest, hardworking people, unrefined, with some rough edges mayhap, but both have a good heart and will be most helpful. They love to gossip and to tell a tall story, often with some truth to it. I also encountered a young bard named Edwin of Greifshold in the “Clucking Goose” who has a gentle voice and is of quick wit. His repertoire of local ballads and songs is noteworthy. He also knows a fair bit of Hengemen songs and tales, but I do not understand their language. They are beautiful in their own way, if simple compositions. If herbs, ointments, salves and matters arcane is what you search you are well advised to seek out a Hengemen called Ava. She is young, but well versed in remedies for a great many illnesses. She has a small shop nestled between two white-tinted houses in Fish Gate. Her humble abode does not have a name, but you will glimpse a wooden sign with a painted flower on it and pick up the scent of dried moss and herbs. Her wares are diverse: tea and medicinal herbs, salves to cure ailments of the eye, tongue and skin, ointments to dress wounds, components for practitioners of the arcane arts, odds and ends to brew potions and finally dried mushrooms with various effects for the bold. For matters arcane, such as spells and scrolls, you will be hard pressed to find a vendor. Some traders on the fish market may have some arcane artefacts on offer and you could always try the proprietor of the Salty Serpent for unusual merchandise. The Margravine regards magic with suspicion and only grants her personal advisor Elfleda of Greifshold the freedom to pursue arcane studies. She is a scholar of many fields, such as metaphysics, herbalism, history, heraldry and lastly the arcane. I cannot help but admire her. You will be well advised to gain her trust and friendship. She often frequents Ava’s store, but is also known to frequent the Gilded Oak. I must confess, dear traveller, that nothing delights me more than freshly baked goods, oven-warm bread, apple-heavy cakes and delightful sweets. Ebba’s bakery The Bread Basket will offer you and your companions spelt, emmer and einkorn bread freshly made every morning. Apple’s grow well in the Green Bent and especially in late autumn Ebba’s bakery will entice you with the smell of cinnamon and stewed apple. The crust of her pies is flaky and crisp and the centre rich and full of flavour. She also offers small sweets, called “Griffons”, as they show a crude depiction of such a creature spreading its wings. They taste of honey and hazelnuts and are a welcome guest on long marches to keep the spirits up. The bakery is located in a side-alley off the main road that leads from the Fish Gate to the Oaken Gate, but she often makes her rounds with a cart. The northern district is slightly elevated with the palace at its highest point. The gate to Highhold is only open in the morning to allow worshippers to pray in the Temple of Reigaro. Highhold has three major sites: The Temple of Reigaro, called “Candle’s Light”; the palace, often referred to as “Longhall”; and finally “Oak’s Hill”. The people of Greifshold treasure the oak tree planted when the first stone of the city was set. 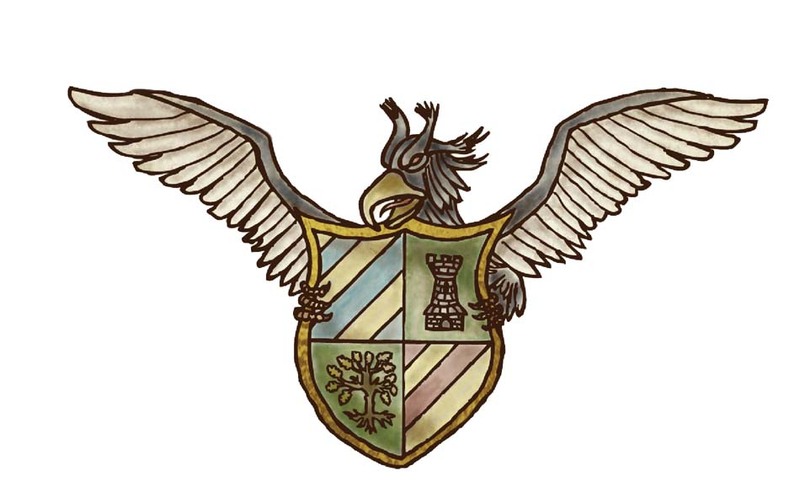 It symbolises the qualities of the people of Greifshold: strong-willed, loyal, unbowed and naturally is the Coat of Arms of the Margravine. Each year in autumn and spring a fair and tournament is held on Oak’s Hill to celebrate Greifshold and its wise ruler. “Longhall” is not open to supplicants, but you may seek an audience with the Margravine. Her steward Aiken of Werta handles such enquiries and usually attends the morning mess at the temple. Longhall resembles the palace of Count Eldred Gladwyn of Werta, with trees and colonnades flanking it on both of its long sides. The archways on its front and richly decorated coffered ceilings inside are evidence for the high quality of craftsmanship and exquisite taste of illustrious Aldrich. “Candle’s Light” is open to all worshippers of Reigaro as well as those who seek to learn about his word. It is said when the temple was built remnants of an ancient structure were found, but I was not able to access the temple’s lower levels, as only priests of Reigaro are allowed to enter. You may ask the servants of Reigaro about this, should you be interested in the history of this place, but I found them to be very reserved. Aldrich’s bones rest here besides the bones of his wife Ethel and the remains of Ebonquill, the loyal Griffon mount of the Margrave. It is customary for travelers to pay their respects and lit a candle to honour the Margrave and his family. Road and river will guide you through the margravate, but beware of what lurks in the forest. I hope you enjoyed this guided tour of the city of Greifshold. Keep tuned for part three, where we will take a close look on surrounding areas and townships. Fun read and I love the pictures. Makes me pine for the days when I knew a regular group of players, who liked story and character driven rpg games. Nothing like sitting around a table immersing yourself in a world as a character you’ve been playing for six months with like-minded folks. Thank you for your comment. That is the kind of campaign I enjoy the most. I hope to achieve my goal to build a world with well rounded NPCs, all “grey” in their motivations and all with a good dose of historical references. I am glad the artwork is evoking nostalgia and longing for a new, like-minded group. I hope you find someone in your area. Always troublesome to find just the right people. I find the whole colonisation theme to be an excellent catalyst for difficult player choices. Both natives and settlers have good reasons to defend their land, add a threat that could end both one might take sides or try to negotiate to unite factions. I have a good idea where it goes, but it will be exciting to flesh out the details. Thank you Azazel. Much obliged. I indeed agree that a detailed world is best for immersion. I presume that is why I like the Sword Coast as a setting. Much is fleshed out, but there are white spots to fit in your own imaginations. I kind of aim for something similar with this setting. I do know the problem of finding a group and maintaining it. I had good ones that ran out of steam after a while because I had too much going on professionally. In other cases the group was good but unwieldy (10+ players) , so it was difficult to bring in the details I enjoy so much as a DM and world builder. The good thing is your extensive library of miniatures. You can cover almost any archetype, so that gives you some flexibility. Maybe you will find some time one day and can make use of the setting, then my goal would be achieved.